I recently received a copy of Bowls of Plenty: Recipes for Healthy and Delicious Whole Grain Meals by Carolynn Carreño. It’s no secret I’m a cookbook junkie. I even have a Pinterest board labeled just that. And it’s no secret I am obsessed with meals in bowls. Often I will set the dinner table with a bowl for me and a plate for everyone else. Silly, but I really love eating all my food together and having all the flavors in one bite. As opposed to Mr. Picky who couldn’t imagine anything worse! Well, I devoured this book which is mostly vegetarian and loaded with whole grains and veggies. 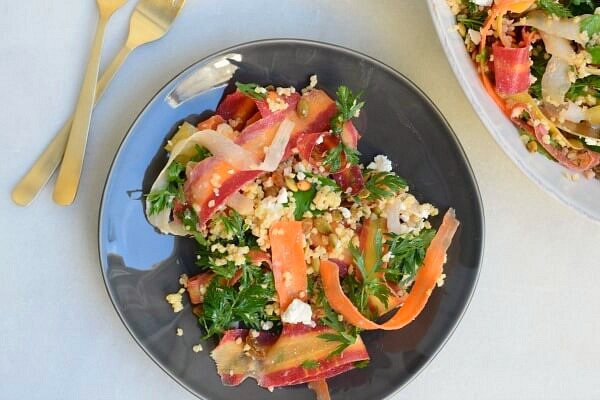 You can check it out at your local bookstore or online to learn more, but I am sharing with you a recipe for a carrot and millet salad that jumped out at me. I have said before that I think both carrots and millet are so underrated. 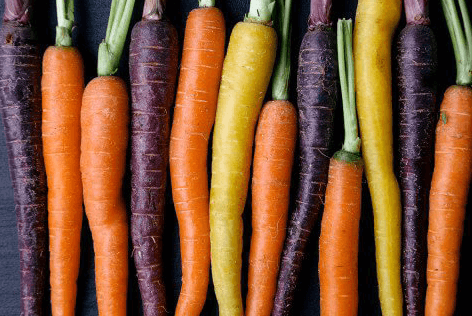 Carrots are so common, inexpensive and available all year round, but so sweet and truly one of the most versatile vegetables. And if you can find rainbow carrots, I mean talk about dramatic and gorgeous! Millet is just an unknown, but so good and so easy to work with. It is a gluten-free grain with a slightly nutty, almost corn-like flavor. It reminds me of couscous, but a little drier. 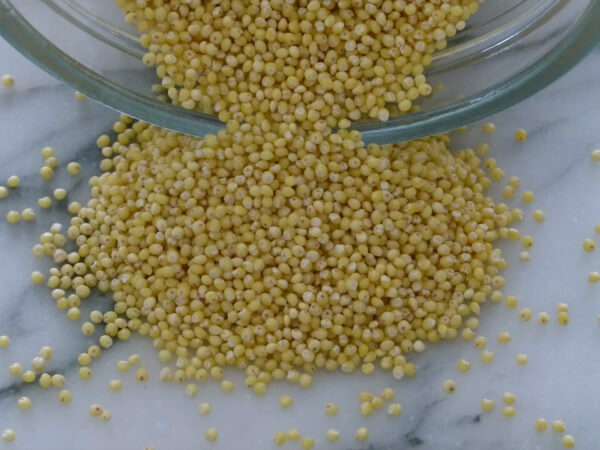 Millet actually has a decent amount of protein and it is one of the few alkalizing grains. I have many recipes on the blog for both carrots and millet, but nothing with carrots and millet. I’ll admit, raw carrots and millet together wouldn’t be quite as delicious without Carolynn’s perfect lemon yogurt dressing, feta (which makes everything more delicious) and green raisins, which somehow I can’t imagine leaving out of this dish. I kept going back for more because those raisins put this salad over the top. 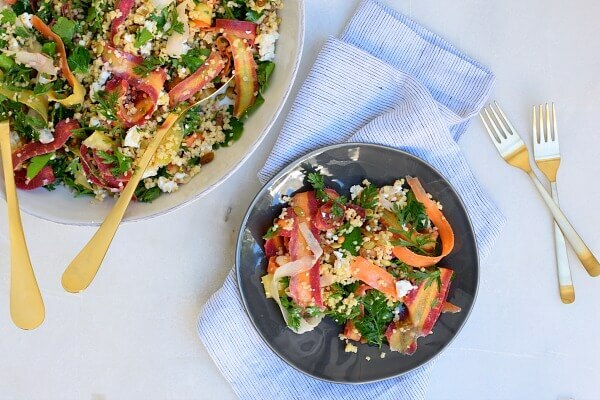 This salad is fresh, bright, timeless (i.e. you can make it all year), punchy and sweet. My husband who is not the biggest carrot or millet fan, couldn’t stop eating this. Even Mr. Picky ate a decent amount. It would be perfect for a pot luck because it can hold up well with dressing. The leftovers were great the next day. 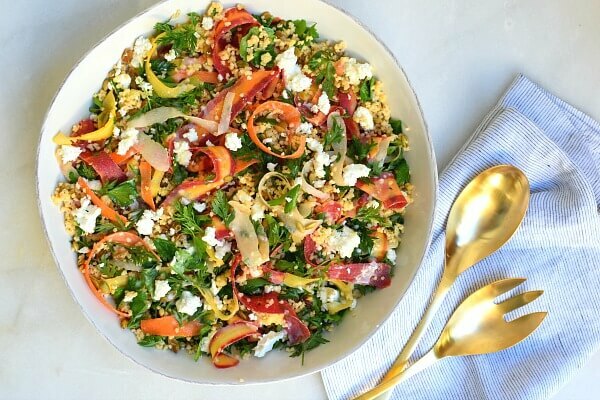 Although I wouldn’t call this a “bowl” in as much as a grain-based salad presented in a serving bowl, you could certainly make a meal out of it. There’s plenty of protein from the millet and the feta. I served this one night with lentil soup, but it would have also been nice with a simple piece of roasted chicken or fish or a roasted cauliflower steak because cauliflower rules the world. Speaking of cauliflower, if you don’t do grains, I would sub cauliflower rice for the millet here. You could go raw or a quick saute. Here are two links for your reading pleasure — one for a cauliflower tabbouleh (using raw riced cauliflower) and one for how to make cauliflower-rice. Nowadays you can buy riced cauliflower, although it’s lickety-split simple to make. Since I’m going to post something decadent on Friday for Valentine’s Day, I thought I would share this light and delicious recipe with you today to balance it all out. Hint: chocolate is in your future. Author: Excerpted from the book Bowls of Plenty by Carolynn Carreño. Copyright © 2017 by Carolynn Carreño. Reprinted with permission of Grand Central Life & Style. All rights reserved. Prepare the dressing: Combine the shallot, lemon juice, vinegar and salt in a medium bowl and set aside for 5 to 10 minutes to soften the shallot. Add the olive oil in a steady stream, whisking constantly. Put the yogurt in a separate bowl and gradually add the vinaigrette , whisking constantly. (seems a little crazy to use to separate bowls to make the dressing, but the author explains that you need to add the thin liquids to the yogurt gradually to keep the dressing from breaking.) Dressing will keep, refrigerated in a covered container for up to 5 days. Reserve ¼ cup of the Lemon Yogurt Dressing and pour the rest into a big bowl to toss the entire salad. Cut the tops off the carrots and wash in cold water. Dry and tear into small tufts. Shave the carrots into long ribbons with a vegetable peeler. A u-shaped one works well. Add the carrot ribbons to the salad bowl with the dressing and toss, coating the carrots with the dressing. Just use your hands. Add the millet, raisins, seeds, parsley and carrot tops. Toss gently to combine. Crumbled the feta over the salad and toss again gently. Drizzle the reserved dressing over the top. *I like to toast millet in a dry skillet for a couple of minutes before cooking it in water. It makes the flavor a little richer. But feel free to boil it straight away. Place ¾ cup millet in a medium saucepan with 1½ cups water. Bring to a boil and cover, lower the heat to a simmer and cook for 25-30 minutes or until the water has been absorbed and the millet is tender. Allow to sit off the heat, covered, for 5-10 minutes. Cool before adding the the salad. **Toast the seeds in a dry skillet over medium-low heat for 5-6 minutes or until golden, or in a toaster oven at 350 for 10 minutes. I’m making this dressing tonight to go with a similar salad. A friend recommended it! Can you tell me where you got the gorgeous gold serving spoon set? Sounds good! I wish I could remember where I bought the set. Probably either Crate and Barrel or West Elm.